Highlighted in Advanced Science News! Congrats Ben! New publication in Macromolecular Reaction Eng.! The homopolymerization of the water-insoluble N-(isobutoxymethyl)acrylamide (IBMA) is investigated for the first time by nitroxide-mediated polymerization. The homopolymerization is characterized by a linear increase in number average molecular weight (Mn) versus conversion (X) to X > 0.80 while maintaining dispersities of Mw/Mn < 1.30. A strong Arrhenius relationship correlates the apparent rate constants and the homopolymerization temperatures between 105 and 120 °C. 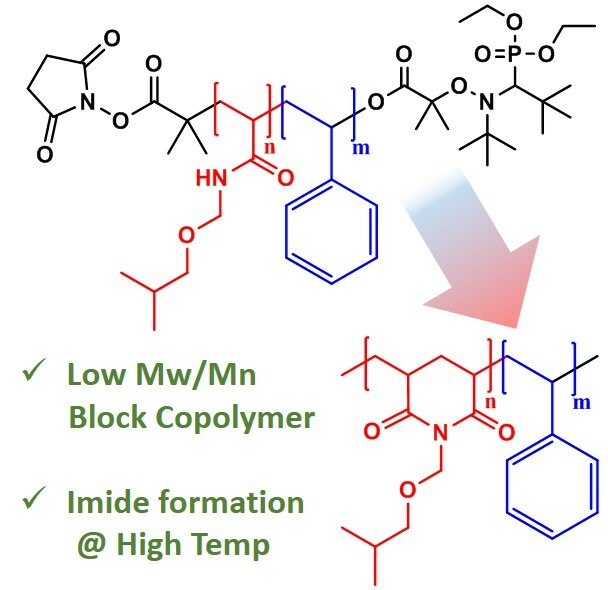 All poly(IBMA) homopolymers are then successfully chain-extended with styrene (S) to form well-defined block copolymers of poly(IBMA)-b-poly(S) suggesting a high degree of livingness of the poly(IBMA) macroinitiators. Thermogravimetric analysis and differential scanning calorimetry are both used to characterize the thermal properties of the homopolymers and block copolymers and identify possible unique degradation of the poly(IBMA) block through imide formation at elevated temperatures. Highlight in Advanced Science News! To read the full article visit Macromol. Reaction Eng. Cleaning up at the uOttawa Engineering Poster competition! Congrats Trevor! New Publication in J. Mater. Chem A!